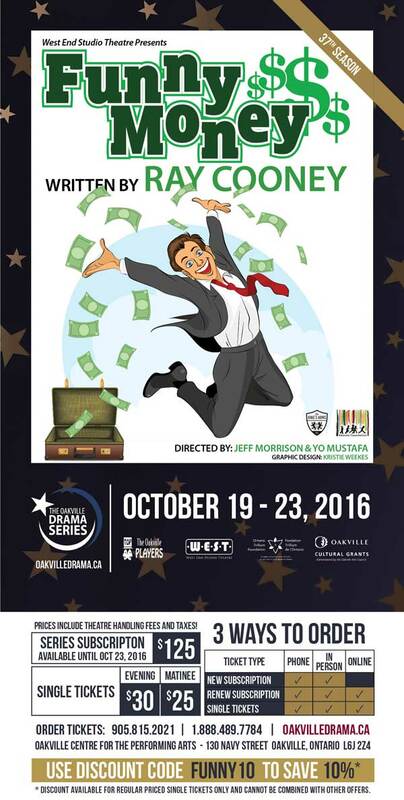 The 2015-2016 Season of The Oakville Drama Series kicks off it's 37th season tomorrow evening with West End Studio Theatre’s presentation of "Funny Money". "Funny Money" is a farce about a mild mannered accountant who accidently picks up the wrong briefcase full of money. His decision to keep it sparks a frantic game of cat and mouse, hilarious innuendo and cruelly funny turns of fate. The battle to hold onto the money leads to increasingly hysterical situations.